‘Lexus Hybrid Zero’ is a unique brand campaign to represent the Lexus brand and answer the question, “Why Lexus Hybrid?”. The One Pager utilizes a zoom effect with the content creating depth as you scroll. The content loads in fixed dimension cards with pretty nice CSS transitions. 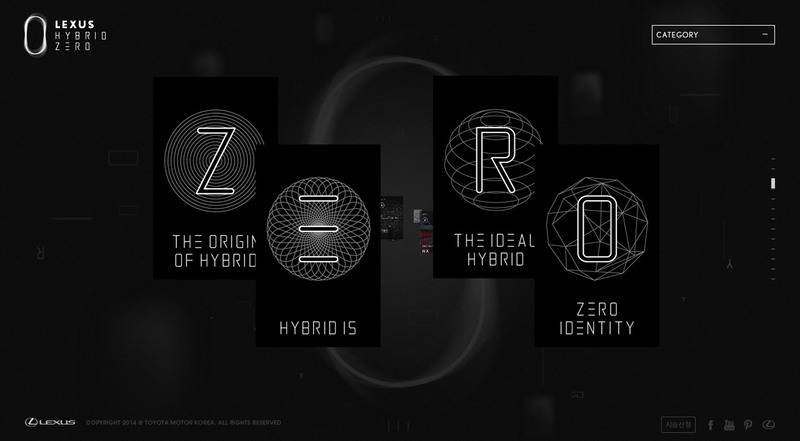 designfever was responsible for creating the Zero Space microsite as a hub for all content related to Lexus Hybrid Zero. We chose to design a three-dimensional space that features floating ‘content’ to emphasize the infinite possibilities represented by Lexus Hybrid Zero.